With 2 million+ active installs, UpdraftPlus is one of the most popular and trusted WordPress backup plugins currently on the market. The popularity of the plugin is due to its simplicity and wide variety of features, including the ability to restore backups created by other backup plugins, such as BackupWordPress. 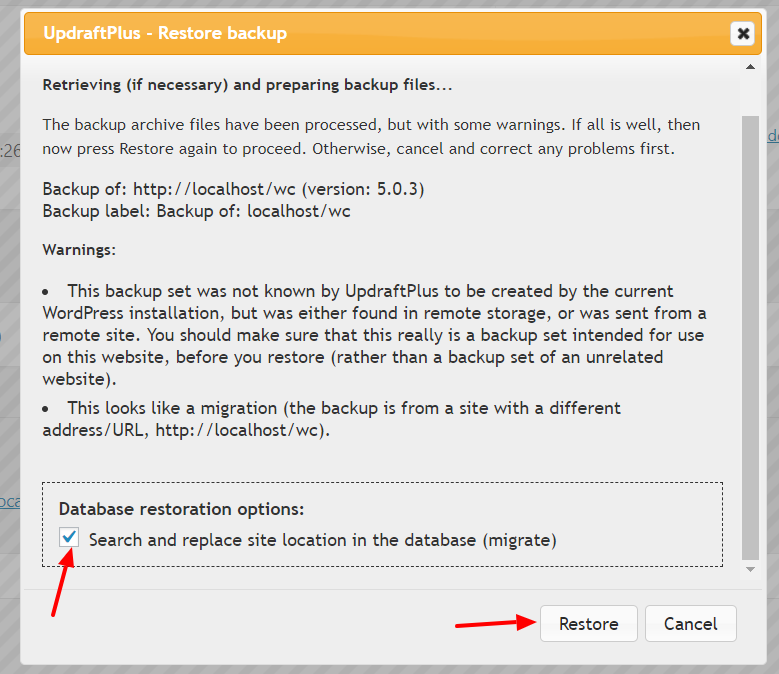 However, unlike UpdraftPlus, BackupWordPress does not give the user an automatic restore option. This mean BackupWordPress users are forced to restore their sites manually by uploading all your files and folders via FTP and importing the database using phpMyAdmin. This task can be painstakingly dull and complicated, even for someone with developer experience. Fortunately, there is a great solution to help users restore their BackupWordPress backups using UpdraftPlus Premium. Please be aware that you can use the UpdraftPlus free version do a basic restore but if you want to restore from a BackupWordpress backup, this feature is only available with the UpdraftPlus Premium plugin. Note: The Premium version of UpdraftPlus has many other useful features, which you can read about here. Once you have installed and activated the UpdraftPlus Premium plugin, it is a relatively straightforward process to use one of the two methods to add and run your BackupWordPress backups to UpdraftPlus. The first step is to find the backup files. BackupWordPress plugin creates a directory with prefix backupwordpress- inside the wp-content directory. Copy your backup zip files from the above directory and paste it inside the wp-content/updraft folder. Next, go to the settings page of UpdraftPlus. Click on the ‘Rescan local folder’ for new backup sets’ link. 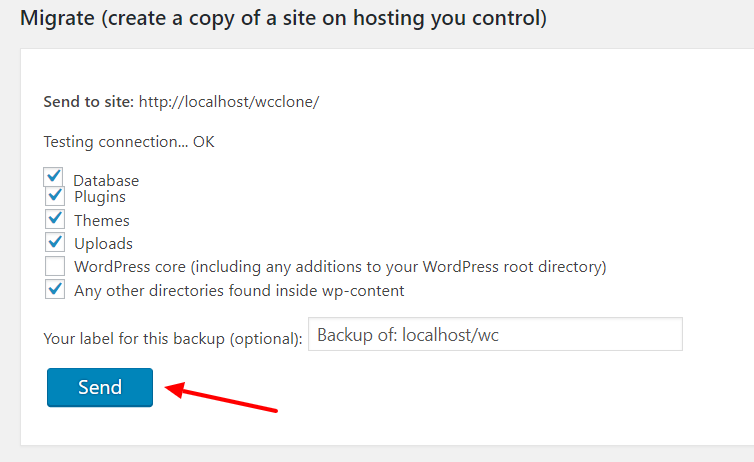 This will rescan the wp-content/updraft directory and add new backups within ‘Existing Backups’. If everything worked, your new backup files will now be visible in the list. You can now restore your backups and also use the other useful features provided by the UpdraftPlus Premium plugin. You can also upload this backup to remote storage if required. This method is almost the same the first, but instead of copy/pasting your backup files, you can upload your BackupWordPress backup file to the ‘Existing Backups’ list. On the UpdraftPlus settings page, click ‘Upload backup file’. Next, choose the locally stored backup file. After the upload process is complete, your backup will be present in the ‘Existing Backups’ list. 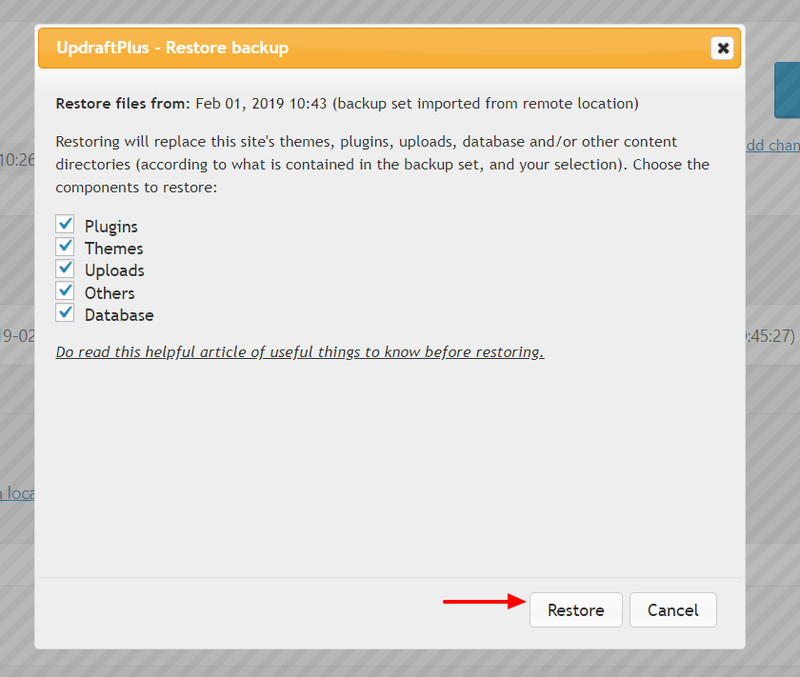 Once the backup is present in the UpdraftPlus list, you can select it and click the restore button. In just a few minutes you should have restored your files and database. That’s it for this tutorial! We hope this explains everything you needed to know on how to add and restore a BackupWordPress backup using UpdraftPlus Premium. If you have any questions, please let us know in the comments below. The post How to restore a ‘BackupWordPress’ backup using UpdraftPlus Premium appeared first on UpdraftPlus. UpdraftPlus – Backup, restore and migration plugin for WordPress. UpdraftPlus is adding an option for people to buy UpdraftPlus Premium as a subscription. This will mean you’ll no longer have to manually renew annually to continue to receive support and updates. We’ll be automatically including a 40% off discount for future years for people who opt for this. Subscriptions can be cancelled at any time so there’s no disadvantage. But if you’d prefer to go for the normal manual renewal, then this is currently still an option as well. Q. How do I receive the 40% renewal discount for the subscription? Q. How can I cancel my subscription? What happens to my licences? The post UpdraftPlus Premium adds an option for annual subscription appeared first on UpdraftPlus. UpdraftPlus – Backup, restore and migration plugin for WordPress. UpdraftPlus announce massive Black Friday sale! Happy Black Friday from UpdraftPlus! It’s the time of year that makes bargain hunters everywhere full of thanksgiving: Black Friday. Take advantage of our amazing Black Friday offers before they’re gone! Coupons are vaild until the end of November 2018. The post UpdraftPlus announce massive Black Friday sale! appeared first on UpdraftPlus. UpdraftPlus – Backup, restore and migration plugin for WordPress. GDPR is an important new data regulation coming into force soon across the whole of the EU. We’re working on fully complying ourselves with our own customer data, and have launched a Data and Privacy Centre here: https://updraftplus.com/data-protection-and-privacy-centre/. This should be fully complete within the next few days. As part of the law, many customers are asking if our software helps them be compliant. We’ve put out details on what information we collect here. One thing you need to ensure is that your backups of your customer’s private data are protected. To help with this, UpdraftPlus Premium can encrypt the data in your backups. It has an industry-standard AES encryptor keeps all of the sensitive WordPress installation data (e.g. passwords, lists of users, secret keys, etc.) stored in your database completely secure. Find out more here: https://updraftplus.com/shop/moredatabase/. The post GDPR compliance with UpdraftPlus: encrypting the databases in your WordPress backups if they contain user data appeared first on UpdraftPlus. UpdraftPlus – Backup, restore and migration plugin for WordPress. We’re receiving an increasing number of questions which relate to the EU’s incoming General Data Protection Regulation (GDPR), which becomes law towards the end of May 2018. At UpdraftPlus (and across all our associated products – WP Optimize, Keyy, UpdraftCentral, MetaSlider), we aim to comply with both the letter and the spirit of this new, quite heavy, law. Its aim is to set a new gold standard for data collecting, processing and retention, and associated rights. We are all individuals too, and we think that the GDPR is bringing in some very valuable tools to allow consumers to have control and protection of their data. As such, we intend to treat all clients – whether EU citizens or not – as if they were EU citizens. We want everybody to know that we aim to treat their data with maximum respect and care. To this end, over recent weeks, we have been doing a lot of “behind the scenes” work on GDPR and data protection issues. One of the fruits of this is our “data protection and privacy centre”. This has quite a number of useful links giving information on what data we have (and usually, don’t have, because we didn’t collect it in the first place), and what we do with it (and what we don’t do with it). The post Data protection, privacy, the GDPR, right to be forgotten, etc. appeared first on UpdraftPlus. UpdraftPlus – Backup, restore and migration plugin for WordPress.